Parenting has transformed me into a frugal creature. Bottles are kept; boxes are treasures; and a single piece of paper can be used multiple times for a zillion projects. Yes, I said a zillion. Check out how these creative mamas used their magic with simple everyday items. Young Master Three (E) is going through a ‘devour-all-yoghurt-in-sight’ phase. This, coupled with all my three young masters’ love for water play makes this hanging yoghurt cup waterfall simply irresistible. My home should be named the Ministry of Missing Socks. This post speaks to me on so many levels. Puddles? Tick. Brush or broom? Tick. Enjoy your giant puddle paint brush. 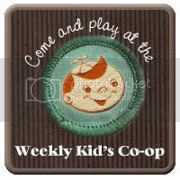 The Kids’ Co-op is co-hosted by over 60 (and growing) fun kids’ blogs. Add your child-focused link here and we’ll share your idea across all of our child-focused blogs. Follow us on our popular Weekly Kids Co-op Pinterest board (which has over 230,000 followers) and The Kids Co-op on Facebook.